A total of 198 containers have been identified to most likely be a total loss due to the fire which broke out last month on board Hapag-Lloyd’s containership Yantian Express. The cargo in the 198 containers will not be inspected and will be sent for destruction once offloaded from the vessel, Richards Hogg Lindley (RHL) as General Average and Salvage Adjusters said in an update. An additional 460 containers which were stored in the affected area have been identified and require inspection. “Door end inspections of the 460 containers will take place in Freeport, but we do not know at this stage when discharge operations or surveys will begin,” the companies added. 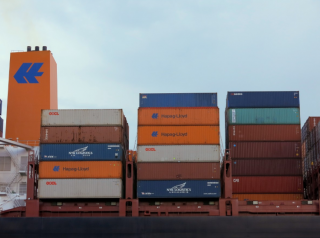 The containers onboard the Germany-flagged boxship were damaged after Yantian Express caught fire when sailing from Colombo to Halifax on January 3. The 7,506 TEU boxship reached Freeport in the Bahamas last week for the evaluation process. “Preparations have been underway with the local authorities, salvers and other interested parties to arrange for the discharge of all containers in the forward most portion of the vessel, in which the fire occurred,” according to Hapag-Lloyd. As informed, it is unlikely that discharge of the containers will commence before the second half of this week.